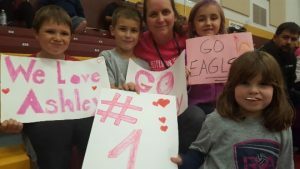 I have been to a lot of volleyball games over the years, but none of them ever compare to “Pink Night.” Never have I been to a volleyball game where the crowd is so excited, the food is so tasty, and the cause is so important. 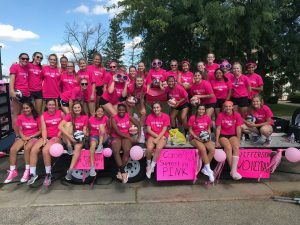 “Pink Night,” which is put on by Jefferson High School in Jefferson, WI, is an annual event hosted by the Jefferson volleyball teams to help raise money in support of breast cancer awareness, with all proceeds going to the Fort Healthcare Mammogram Voucher Program. The event, which occured on Tuesday, Oct. 2nd, brought in members from the Jefferson community and beyond, leading to bleachers full of people. There is something very powerful about looking around a gymnasium and seeing the students, staff, and community members dressed in pink knowing that everyone is here fighting for the same cause. Junior varsity player, Presley Biewer, said, “It’s just really special to play in such an important game that has such a good cause behind it.” Biewer, who despite only being a freshman, made the more prestige junior varsity team said this has been her favorite part of the season so far. “Just looking out into the crowd and knowing that this is more than just a game tonight is really a cool and inspiring thing.” Biewer said. Biewer’s teammate, Aidyn Messman jumped in to say that, “the crowd was the reason we were so determined to win.” The junior varsity Lady Eagles won 2-3, beating out opponents Beloit Turner. Varsity also one their match against Beloit Turner in a final score of 3-0. Crucius is right, breast cancer is something that affects a lot of people. Studies show that about one in eight women develop invasive breast cancer at some point in their life, with an estimated 266,120 new cases of breast cancer expected to be diagnosed in 2018 alone. With stats like that it can be hard to look at the positive side of things, however with events like “Pink Night,” we are only moving in the right direction to one day end the battle of breast cancer. Fans cheering on their favorite player!